ALLEGRA BOVERMAN/Staff photo. Gloucester Daily Times. Gloucester: During a PTO-sponsored enrichment program at Beeman Elementary School on Friday given by the Museum of Science. Museum educator George Pechmann who had one hand on a van de Graaf Generator, was demonstrating that humans conduct electricity. While he touched the hand of one student, the others standing behind him got shocked, too, because they each had a hand on one another's shoulders. 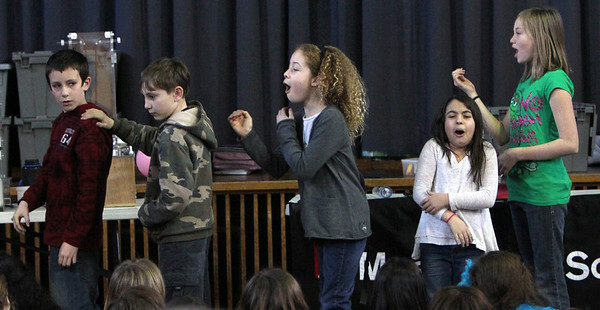 From left to right are: Austin Marraffa, Josh Mello, Hope Miller, Bianca Soares and Emily Briere.